The neuron is the working cell within the brain. The structure of neuron is made up of different components, including the cell body, the dendrites and the axon. The axon is the portion which is most exposed to injury in a shear injury, as the long protrusion can extend substantial distances across differententially moving layers of the brain. A typical structure of the neuron to some degree resembles a dinner fork. The handle of the fork would represent the axon, the tines of the fork are the dendrites, the end of the fork is the synaptic terminal and the area where the tines branch off fork, is the cell body, or soma. The structure of neuron and a neuron’s job is information transfer, from one end of a given neuron to the other and from one cell to another cell. Information transfer within a cell is called intracellular signaling and information transfer between cells, intercellular signaling. The intracellular signal begins at the soma body part of structure of neurons and runs down the axon, to the terminal end. The intercellular transfer is across the synapse, where the signal jumps from one neuron to another neuron. The Role of the Axon in Intercellur Signaling. As part of the structure of neuron, the role that the axon plays in intercellular signaling is roughly equivalent to the wire that connects a switch to an electrical fixture. Like the wires behind your drywall, the axon may run substantial distances, as much as a meter. Like an electrical wire, it is thin. And like a electrical wire, it transfers electrical impulses. Axons Are Vulnerable to Shearing Forces. The axon is vulnerable to injury when the brain begins to move as a result of rotational forces. When traumatic acceleration/deceleration forces are placed upon the brain, the layers, at progressively greater distances from the fulcrum of the motion, will move at differentential speeds, creating a sliding of these different layers across themselves. The impact of this sliding is that the axon is quickly stressed beyond its tolerance. Even if the axon is not severed as a result of such force, it may be significantly damaged. As an electical wire has insulation, so does an axon. To protect the axon from damage and to assure that its electrical impulse do not stray, the axon is protected by insulation called the myelin sheath. Unlike what we see on wires, the myelin sheath is not a continuous covering. The myelin sheath is made up of glial cells, laid end to end over axon. The glial cells can be thought of as similar to rolls of paper towels, with the material wrapped many times around the core of the axon. Just as if you were to line up a row toilet paper rolls across a room, there are gaps between each glial cell. At each space between one glial cell and another, there is a small gap in the myelin. These gaps between glial cells are called the Nodes of Ranvier. 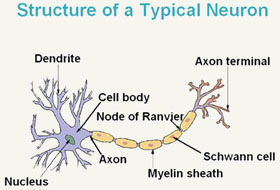 The Nodes of Ranvier serve an important purpose, providing a channel for energy to enter the axon to boost the signal as it goes down the length of the cell. When the axons insulation, the myelin sheath, is damaged, the speed of information processing within the brain can be profoundly impacted. Processing speed problems and the associated attention concentration problems, are among the most common deficits after a MTBI or concussion, and this diffuse injury the axons is likely the culprit. Source: Levitan , The Neuron, ©1997, Oxford University Press.